Whether you are new to collecting records or a seasoned vinyl hoarder, one of the joys of expanding your collection is finding a bargain. Whether that means picking up an album in a sale or digging through the crates in your local charity shop, you never know when or where you might uncover something really valuable. Only 250 demo copies of this single by American soul singer and producer Frank Wilson were ever pressed, and of those only around five are reported to have survived when the rest were destroyed by Motown boss Berry Gordy. Stories about the reason for their destruction vary, but rumour has it that Gordy wasn't too happy about the prospect of one of his best producers launching a singing career and ordered the demos to be trashed. It's also said however that Wilson felt the same way and decided against releasing the single, but either way, a handful slipped through the net and while the exact number of surviving copies isn't known for sure, Gordy is said to possess one of them and another sold at auction in May 2009. However, the Leicestershire-based record dealer who organised the sale reported that the buyer wished to remain anonymous, although the sale price was confirmed to be £25,742. A 78-rpm blues record by Tommy Johnson fetched over $37,000 (approx. £29,000) in 2013 when an Oregon-based record collector shelled out for a super-rare copy of 'Alcohol and Jake Blues', released on the Paramount label in 1930. Incredibly, buyer John Tefteller already owned a copy of the same record, but explained that the one he bought at auction was in much better condition and that the record was worth every penny since the master tapes had long since been destroyed. Most of the records on this list are of a certain vintage and their value stems partly from their age, but in 2014 a relatively new record shot into the top 10 when a rare test pressing of Aphex Twin's Caustic Window was sold at auction for a staggering $46,300 (approx £36,000). As it turned out, the buyer was none other than Minecraft inventor Markus 'Notch' Persson, who had evidently decided to splash some of the cash he'd earned by creating the word's most popular video game on a rare record by one of his favourite artists. 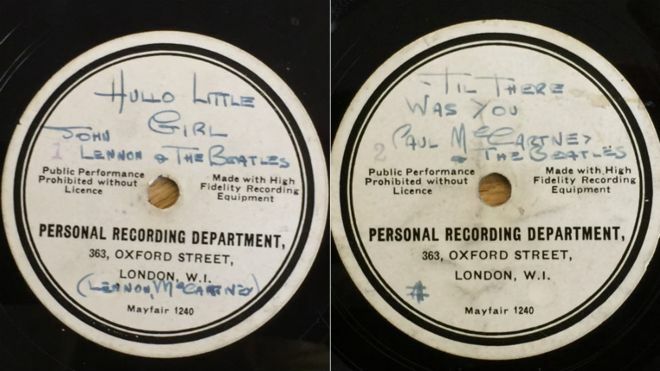 Said to be the 'Holy Grail' for collectors of Beatles records, a 10” acetate of an early demo by the Fab Four featuring the songs ''Til There Was You' and b-side 'Hello Little Girl' (misspelled on the disc as 'Hullo Little Girl') was found languishing in the attic of one Les Maguire, a fellow Liverpudlian who had somehow come into possession of the record during his time as keyboardist for Gerry and The Pacemakers. It sold in Warrington to an unnamed buyer in March 2016. Described as 'the record that launched the Beatles' because it was recorded as demo for EMI, the test disc bears the handwriting of Beatles manager Brian Epstein and, as you can see from the label below, was recorded and pressed at none other than 363 Oxford Street, home of our store in London's west end. How's that for a piece of vinyl history? One of the other more rare items is this Beatles compilation from 1966, released only in North America initially and then later in Japan, but not in the UK or Europe. One of the reasons for its relative scarcity is that the early versions featured the infamous “butcher” cover, with John, Paul, George and Ringo draped in dismembered dolls and pieces of meat. It was swiftly withdrawn and replaced with much more tame artwork (see below), but the original remains a sought-after item for Beatles collectors and a mint edition sealed copy became the most expensive copy of the record in history when it sold at auction in February 2013 for $125,000 (approx. £98,000). It's often the case that one copy of an LP can differ hugely in value from the next as the result of some defining feature that makes it more rare, whether that's a printing error or a signature. In the case of this copy of John Lennon and Yoko Ono's Double Fantasy, sold in 1999 for an astonishing $150,000 (approx. £118,000), the macabre detail that rendered it so valuable was the fact that it had been signed by Lennon himself just hours before his death on December 8th, 1980. As such it may well be the last record Lennon ever signed and it became one of the fie most expensive records ever sold as a result. Any original 1967 pressing of Sgt. Pepper will fetch a decent price at auction, particularly if its the mono version with the black Parlophone label, but if one signature can dramatically increase the value of a record, then imagine what four can do. In the case of this copy sold at auction in 2013 to a buyer from the midwest in America, the auctioneers had estimated a sale in the region of $30,000 and were stunned when the item ended up selling for nearly 10 times that amount, fetching an astronomical $290,000 (approx. £227,000) and breaking the record for a copy of their 1967 album. If you anything about Jack White, variously of White Stripes, The Dead Weather and The Raconteurs, then you may also know that he is not only one of the busiest men in music, but he's also a huge vintage gear and vinyl collector. His studio and label Third Man specialises is vintage recording techniques and unusual vinyl releases, so it's perhaps not too much of surprise to learn that he is the proud owner of one of the three most expensive records in the world. For years, Beatles drummer Ringo Starr was known to own the very first copy of the band's self-titled double album from 1968, since the records were printed with serial numbers in sequence and Starr's copy bears the number '0000001'. He eventually sold his copy at Julien's auction in the U.S. for $790,000 (approx. £620,000) in December 2015, again to an unnamed buyer, along with his famous Ludwig drum kit, which was bought by Indianapolis Colts owner Jim Irsay for a whopping $2.2 million. By far the most expensive record ever sold is this 2015 album by Wu-Tang Clan, of which this is the one and only copy ever produced. The record comes with a contract which stipulates that the buyer may not attempt to sell or make money from the record for 100 years, although the owner may release the album for free should they wish to. Unfortunately, that hasn't happened yet, since the buyer turned out to be the controversial Turing Pharmaceuticals CEO Martin Shkreli, who has become something of a pariah in America thanks to his company's buyout of an anti-HIV drug, and its subsequent price hike of more than 5,000 %. He paid the asking price of $2 million (approx. £1.5 million) to become its owner, which didn't go down too well with some fans.